Elf might not have been the horse Molly Sorge would shop for, but he turned out to be just what she needed. To be honest, if I were horse shopping right now, I wouldn’t give my own current horse a second look. 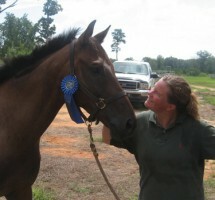 I spent many years bringing along young horses and off-the-track Thoroughbreds and selling them on. For the horse that ended up staying with me, being “mine,” I always had visions of a leggy, flashy, freakishly talented yet remarkably kind and quiet steed. You know the one—that imaginary horse that is the standard in our heads when we look at any other creature. Oh, and he’d definitely be a striking dapple gray. Enter Elf, the short, built-downhill, spooky plain bay creature I’ve spent the last eight years with. I guess it’s kind of like marriage, right? In the heady days of dating, we all picture ourselves ending up with a hybrid of George Clooney and Brad Pitt who cooks a gourmet dinner for us after grooming for us at a competition all day. And then we end up with an average-looking Joe who falls asleep while watching Jeopardy. But we know, if we can think through the snoring, that this is just who we’re meant to be with. I didn’t buy Elf. He kind of just happened into my life. I took care of him as a foal, as part of my “working off my board” deal at an Upperville, Va., farm. I really liked his dam and thought her scrawny, munchkin foal was cute. One day after he was weaned and sent to the other side of the farm, I saw his breeder and owner walking her dogs. I happened to mention to her that if said foal went to the track and didn’t pan out, I’d love to know about it. I thought he might make a nice project to turn into a kid’s horse. Be careful what you wish for—she called me that evening and told me to just go get him, that she didn’t think he was big enough to spend the money to break him and register him and send him to the track. Any other sane person who was already supporting two horses by waking at the crack of dawn to feed, turn out and muck other peoples’ horses would have laughed nervously and said “Oh, that’s OK, I’m not really in a good place to take on another horse at this moment, but let me know if he’s available later.” But I’ve never been that any other sane person. I called my then-boyfriend (the now sleeping-through-Jeopardy husband) and had him light the road with his truck headlights as I led a weanling Elf back to my side of the farm that night. I called a professional trainer friend the next day and said “I got a free horse!” She sighed resignedly and told me, “Molly, there’s no such thing.” If you ever see Elf at an event, you’ll know him by his show name, No Such Thing. Elf got chucked back out into a 50-acre field with a stream for a few years. I brought him in to play with him and he got shots and his feet trimmed. Ground manners were learned when I had to call the vet to stitch him up and then treat him for various lacerations as he patiently taught me that in fact, there is no such thing as a free horse. When he was 3, I decided it was time to break him and start teaching him the ropes so he could get sold ASAP as that cute kid’s horse. He was still looking like a large pony at this point, and I had another off-the-track project horse I wanted to compete. But Elf quickly showed me that selling him to a young rider would be the equivalent of child abuse. Sweet, placid and well-behaved on the ground, he was inordinately hard to break—girthy, over-reactive and as spooky as a horse can get. Any change in balance on my part could result in a lightning-fast spin and bolt on his part. A careless pat on the neck might set off fireworks. I resigned myself to spending a few years with him and sold the project horse. As I diligently trained Elf, my goal was always to get him broke and safe enough to sell on. You know, so I could buy that beautiful, athletic dapple gray. I’m not sure at what point Elf stopped being “possibly for sale” in my head. We worked through the spinning and bolting. He learned that jumps don’t bite. As the years went on, he became a willing participant in whatever I asked him to do. Drama queen he might still be, but he’s genuine and honest when his brain is turned on. He’s not freakishly talented, and he’s never going to be a fancy horse, but I know every inch of him and am so proud of how far he’s come. So, now that he’s 8 and being on his back and looking up his short little neck feels like home, I guess he’s officially “mine.” He still spooks at things he sees every day, but he doesn’t put as much effort into it. And we’ve had a lot of fun adventures together. Now that he’s broke and reliable, I spent about a week composing for-sale ads for him in my head this fall. But I never got around to actually writing them out. I won’t lie—I still browse through CANTER listing and online ads. And I still get a little twinge when I see a striking gray up for the taking. But for right now in my life, Elf is just the thing. Each Thursday, we’ll feature a blog from a member of the Chronicle staff. We’re just like you—juggling riding and competing with work and family. A few years ago, Associate Editor Molly Sorge moved from living in horse-heaven Middleburg, Va., to a bit more of a remote location near Richmond, Va., so her competitive goals with Elf have to work around her hectic work schedule and begging trailer rides from friends. She still manages to get Elf out on the town a few times a year.